What Happens When You Don’t Pay Your Student Loans? This is how it starts: emails, calls, snail mail, calls to your emergency contact. All of them can be a nuisance but still ignored, but once the federal government begins garnering your wages (e.g. taking money from your paycheck directly), you’ll definitely start listening! When you start having hardship with paying off your loans, you should consider consolidation, deferment and forbearance. After 90 days of not paying your loan, it will get reported to the three main American credit bureaus. This will make it harder to rent somewhere to live, purchase a car, and increase interest rates for you, while also dragging your credit score down which could take years to untangle and bring your score to its previous level. 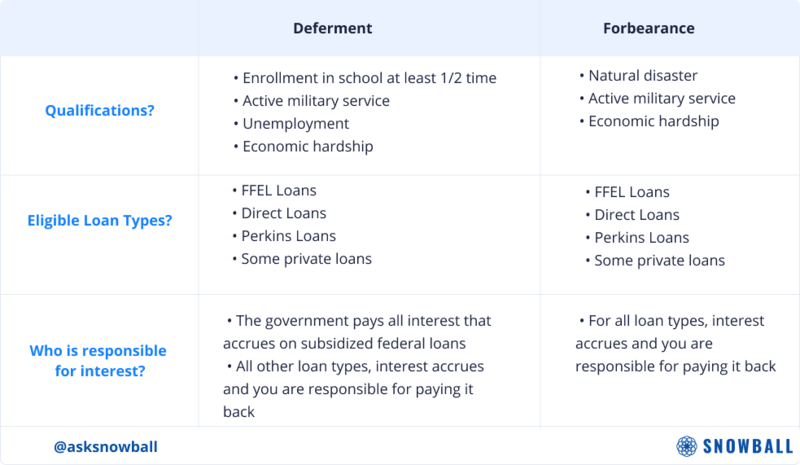 Student loan deferment is a way that borrowers can temporarily pause or sometimes even lower the payments they make monthly, and there are a fair number of instances where the borrower does not have to pay the interest that accrues. Forbearance is also when you pause or lower payments, there are even some instances when it is mandatory that your servicer provides you forbearance. However, the main difference is that in every case of forbearance, the borrower is responsible for the interest that accrues between payments. Your loan is delinquent as soon as you miss a payment, after 90 days, your credit score is negatively impacted. You may pay a small fee, and receive a number of emails and notifications on your loan servicing portal, but there is not an overwhelming amount of outreach to you. Moving out of the country does not excuse your debt, declaring bankruptcy won’t erase it, and the hit to your credit will inhibit your ability to rent an apartment, purchase a car, even get a cell phone plan will be severely hampered if you allow your loans to default. We recommend being in communication with your loan servicer, between payments, online and by phone, which will make planning ahead easier if you foresee you may have trouble paying on time in the near future. Talk to the loan servicer or the Department of Education and negotiate payment terms. Yes, you can call them!